I hope everyone had a wonderful Christmas. Matt and I missed out on a white Christmas here in Dallas, but had a great time visiting our aunt, uncle and cousins in Midland. My aunt Renee is an awesome cook. 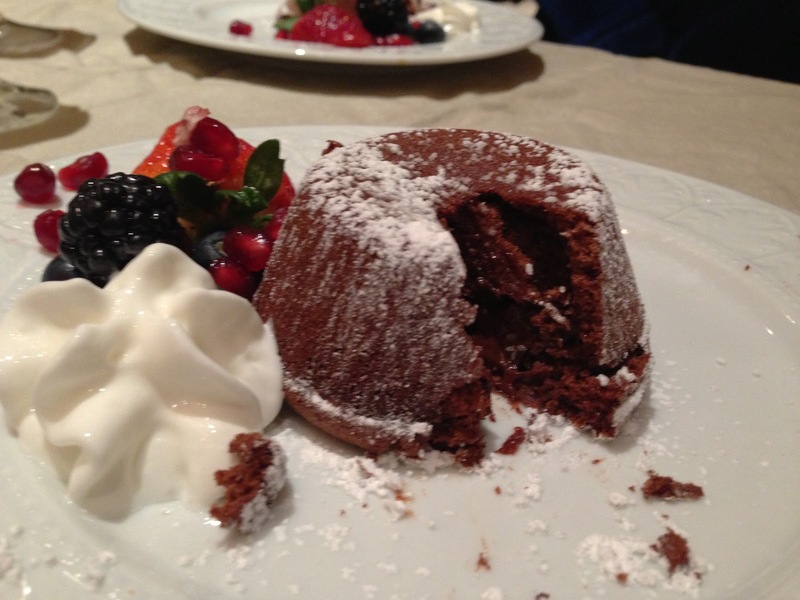 If you don’t believe me, just take a look at these chocolate melting cakes. The cakes are super easy to prepare and a great recipe if you want to make these the day before your guests arrive. We doubled this recipe and had more than enough to serve the 10 of us for our day after Christmas dinner. 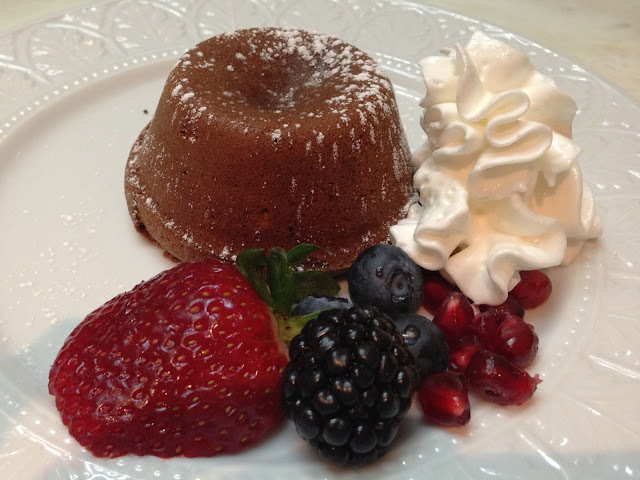 I don’t think I have to convince you that these chocolate melting cakes make for a gorgeous presentation…. they are a crowd pleaser for sure. Enjoy and Happy New Years Eve!! Heat cream until bubbles appear around the edge. Add chocolate. Let stand several minutes. 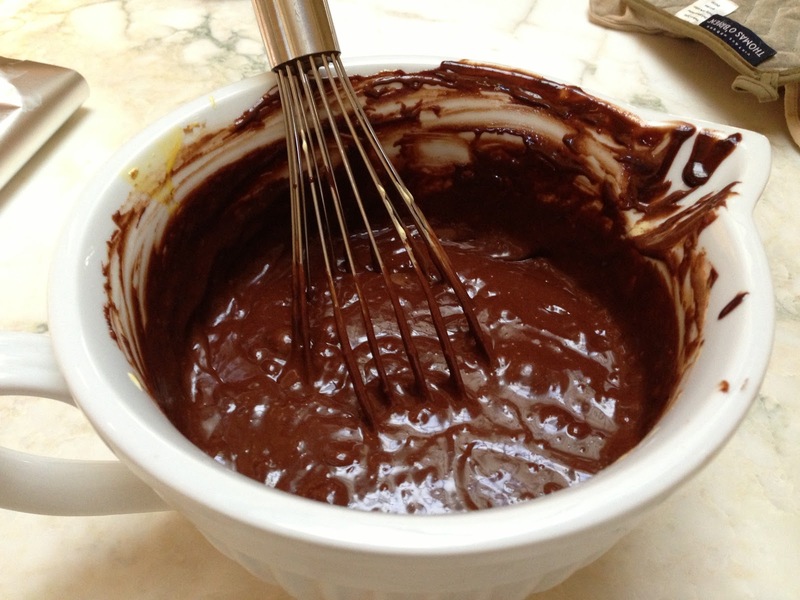 Stir until chocolate has melted. Beat the egg yolks, sugar and vanilla until slightly thickened and pale yellow. Melt buter and remaining chocolate. Add to egg yolk mixture. Fold in almonds and egg whites. Spoon half the batter in prepared muffin cups. Place a frozen ganache cube in center of each. Top with remaining chocolate batter. Freeze until solid, at least 1 hour. Bake for 20-25 minutes in a 375 degree F oven (decrease baking time if using standard 12-cup muffin pan). Garnish with berries and Reddi-wip. Cut into the cake and watch as the chocolate melts out! 1. 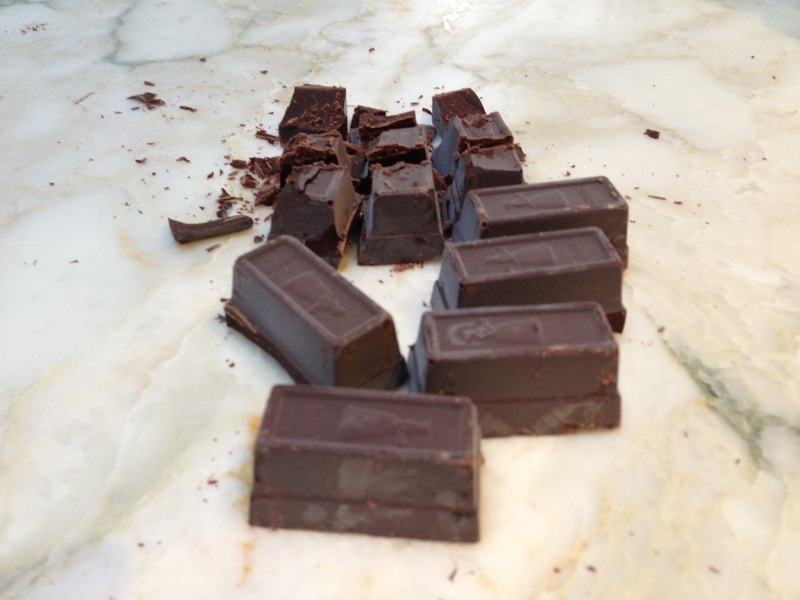 Chop 2 ounces chocolate into small pieces. Heat cream in a small saucepan until bubbles appear around the edge. 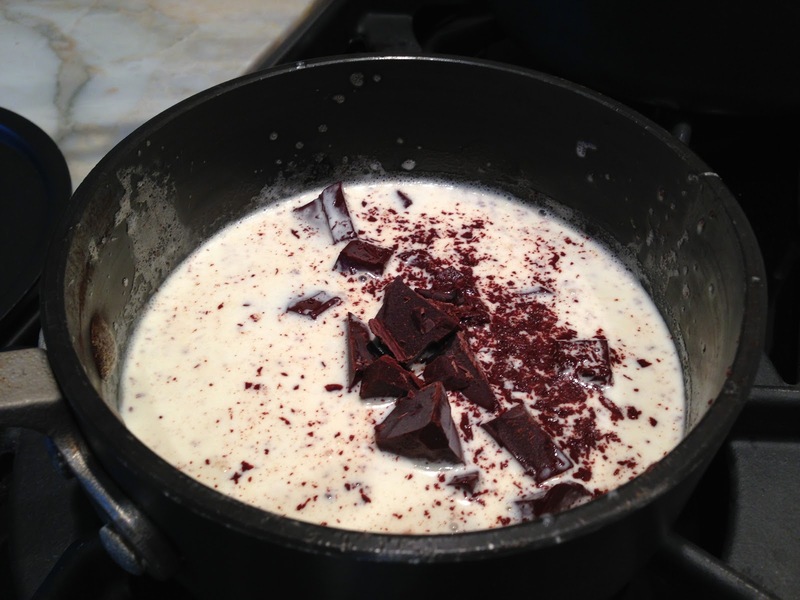 Drop chocolate pieces into cream, let stand several minutes, and stir until smooth. Pour ganache into squares of a plastic ice cube tray. Free until solid. 2. 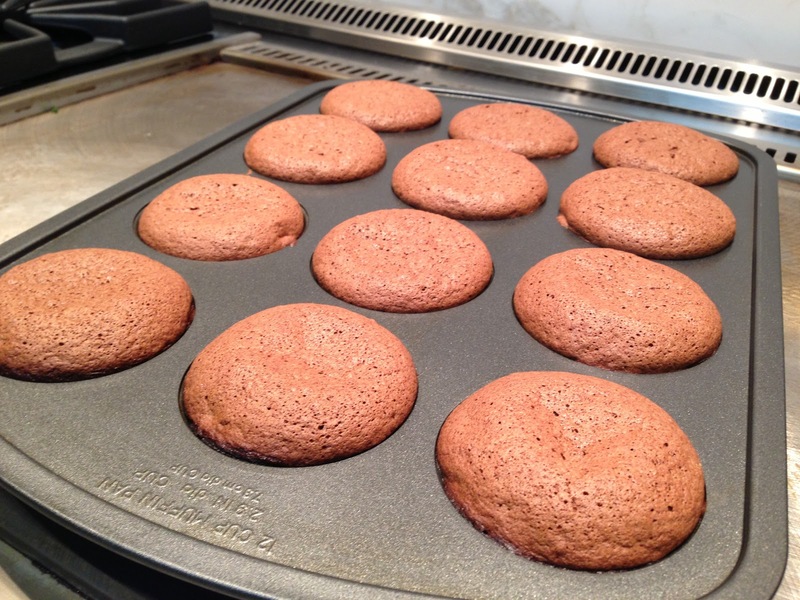 Grease an extra large, 6-cup muffin pan (we used a standard 12-cup muffin pan). Melt butter and remaining chocolate in double boiler. Stir until smooth, and let cool slightly. In a medium bowl, combine egg yolks, 6 tablespoons sugar, and vanilla. 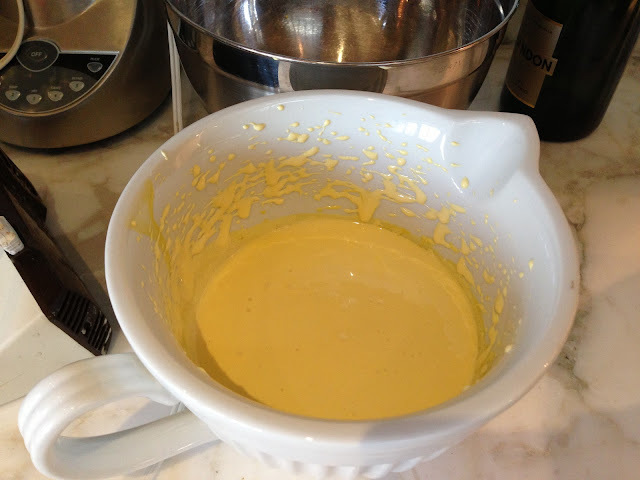 Beat with an electric mixer until slightly thickened and pale yellow (5 to 8 minutes). 3. 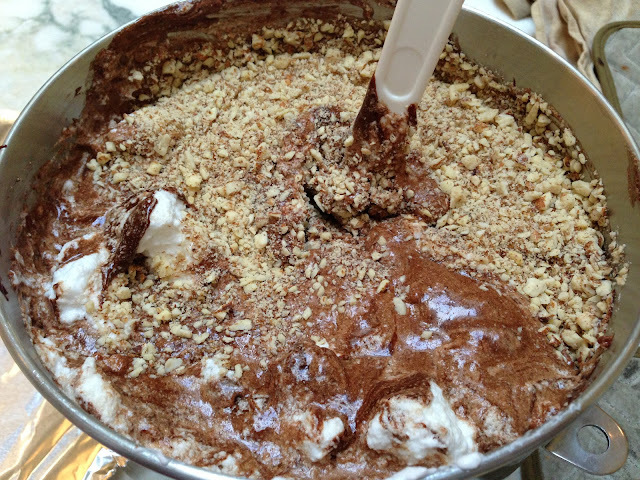 Add chocolate-butter mixture and combine. Fold in almonds. 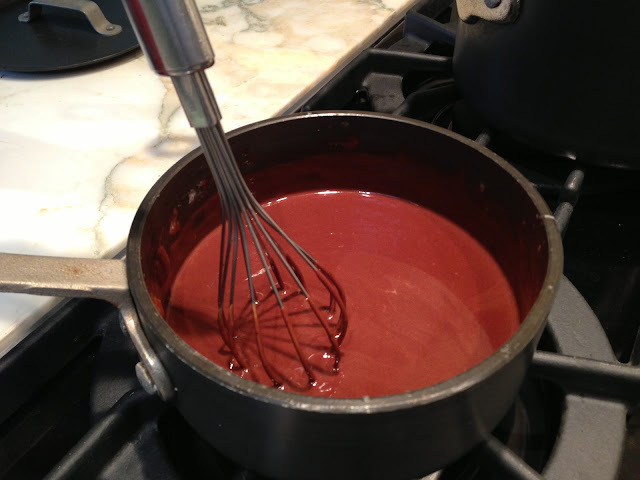 In a separate bowl, beat remaining sugar with egg whites until stiff; fold into the egg yolk-chocolate mixture. Spoon 3 tablespoons (1 1/2 Tbsp. 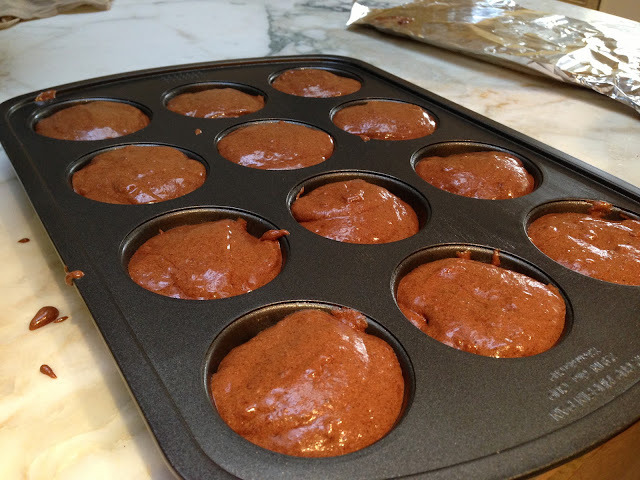 if using a standard muffin pan) of batter into each cup of the muffin pan. 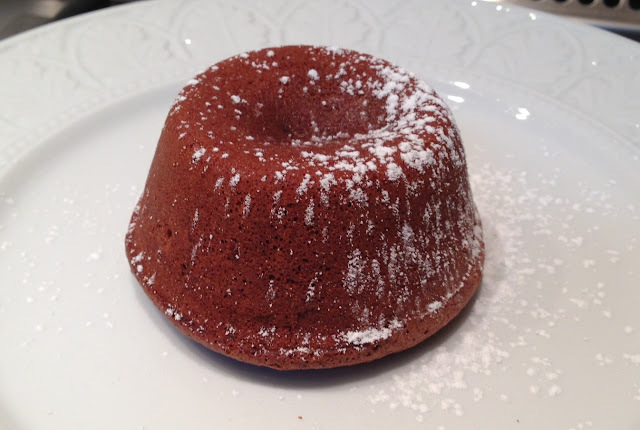 Place a frozen ganache cube in the center of each. Spoon remaining batter over tops, making sure ganache cubes remain centered and are completely covered. Freeze until solid, at least 1 hour. 4. When ready to bake, preheat oven to 375 degrees F. Bake for 20 to 25 minutes (decrease the baking time if using a 12-cup muffin pan). Let cool 5 to 10 minutes. 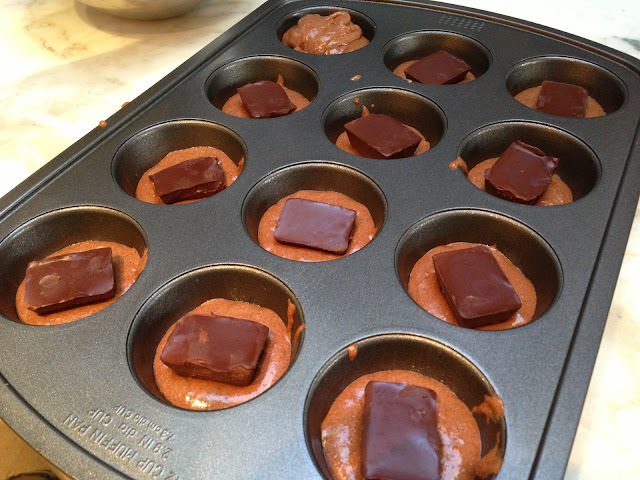 Carefully invert the muffin pan over a clean towel and remove cakes with a spatula. 5. 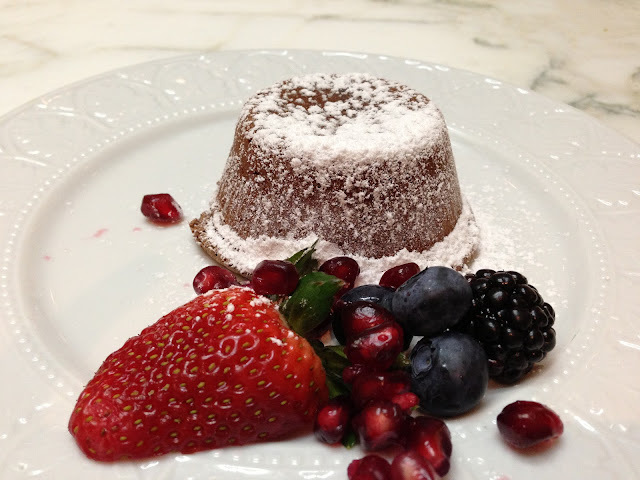 To serve, dust with confectioners’ sugar. Garnish with berries. *Note: If frozen ganache cubes are difficult to remove from the ice cube tray, dip the bottom of the tray in hot water.